BOSTON — A $1,000-per-month stipend for every adult and a new benchmark for economic health were among the reforms Democratic presidential candidate Andrew Yang proposed in his broad-ranging speech before a rally on the Boston Common Wednesday. 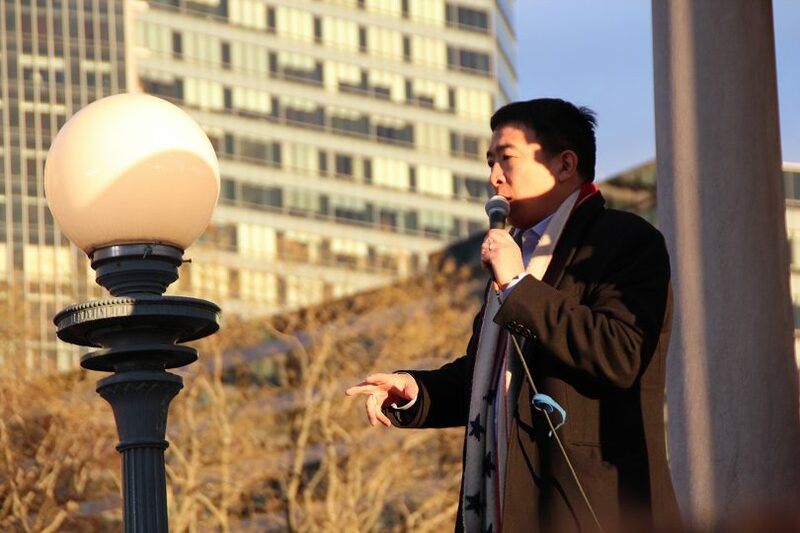 Standing in chilly air on the Boston Common’s Parkman Bandstand, Yang characterized his campaign as a bipartisan effort that also aims to thwart President Donald Trump’s policies. 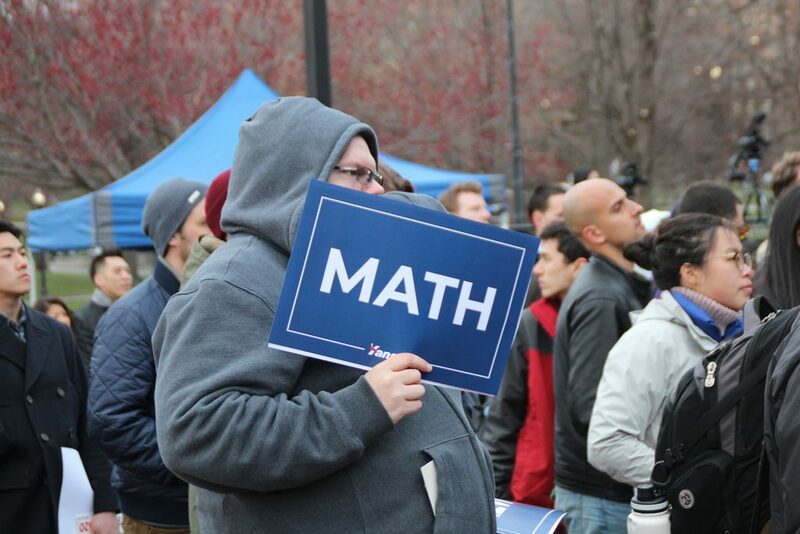 The crowd listened to Yang for about 30 minutes — some having waited an hour before — and held up signs that read “Math” and “Welcome to Mathachussetts,” alluding to Yang’s 2020 campaign data-centric mantra. Yang spoke against technological automation, which he said displaces workers — a phenomenon he said has translated into vitriol among swing-state voters who work in manufacturing, leading to the Trump’s victory in 2016. In response to technological automation, Yang has been advocating for universal basic income in the form of his so-called “Freedom Dividend,” a $1,000 stipend for citizens above the age of 18. Yang said the stipend could help further opportunities for minority communities. Yang is an entrepreneur who in 2011 founded Venture for America, a nonprofit that trains recent graduates to work for startups in emerging cities like Baltimore, Detroit and St. Louis. A political newcomer, he entered the now-crowded Democratic race before political household names like Sen. Elizabeth Warren (D-Mass. ), Sen. Bernie Sanders (D-Vt.) and former Rep. Beto O’Rourke (D-Texas). If elected, Yang, whose parents immigrated from Taiwan, would be the nation’s first Asian American president. Politicians and news organizations, Yang said, have skirted around blaming technological automation on economic problems and instead remain engrossed on the wrong culprits, from Trump’s fiery rhetoric against immigration to the fixation on the Trump-Russia probe. “Immigrants don’t have anything to do with economic dislocation,” he said. Yang has also promised to staple green cards onto visas of university students in the U.S., countering the Trump administration’s tightened student-visa policy on Chinese nationals. On metrics, Yang said the gross domestic product should not be a main barometer of economic well-being, as it centers too much on making profit and ignores other measures like freedom from substance abuse, mental health and life expectancy. For some rally attendees, Yang struck a more bipartisan tone compared to other Democrats in the race. Mike Rebello, 30, of Plymouth, said Yang’s policy proposals are factual and that one needs to “stand out,” like Trump did in 2016 as an outsider candidate, to thrive in a crowded political arena. Although she said she has not made up her mind yet in supporting Yang, Elisia Moy, 20, of Newton, said Yang’s candidacy furthers Asian American representation on the political stage. Moy said she’s also interested in hearing Yang’s stances on climate change. 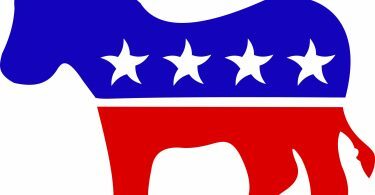 “He does talk about [climate change] a little bit, but it’s not his main push, which makes sense because you can only focus so much in a campaign,” Moy said. 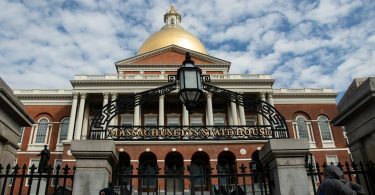 Yang has expressed his support for the Green New Deal, a policy proposal centering on renewable energy put forth by Rep. Alexandria Ocasio-Cortez (D-N.Y.) and Sen. Ed Markey (D-Mass.). Other attendees also said they haven’t solidified their support for Yang and came to the rally to hear his proposals out. Chris Kimball, 27, of Somerville, said he remains a Sanders supporter but is interested in Yang’s push for universal basic income. Canada-born Cambridge resident Marcus Pannu, 25, said he appreciates Yang’s efforts in having conversations with conservative figures like Ben Shapiro. “I liked how he showed up on a conservative show and stood his ground,” Pannu said. Pannu, who said he remains a Sanders supporter, said the universal basic income isn’t feasible at the moment, but he said a discussion on it would gradually further the cause. “I like that he’s bringing it to the forefront,” Pannu said.